RxDentistry: A 75-year-old man presented to the emergency department with diffuse swelling of his tongue that had begun a few hours earlier. He had no known history of allergies. He had been taking antihypertensive twice daily for the past three years . Treatment with which antihypertensive is most likely to cause this appearance? 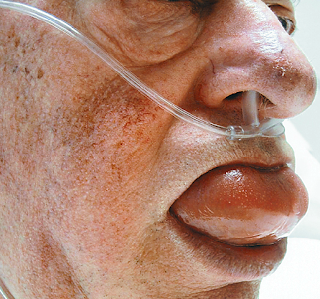 A 75-year-old man presented to the emergency department with diffuse swelling of his tongue that had begun a few hours earlier. He had no known history of allergies. He had been taking antihypertensive twice daily for the past three years . Treatment with which antihypertensive is most likely to cause this appearance? Angioedema of the tongue is most associated with treatment with an angiotensin converting-enzyme inhibitor. The patient was treated with epinephrine, antihistamines, and corticosteroids; the symptoms resolved over a three-hour period. Laboratory tests subsequently showed that tryptase and complement component levels (C1q, C3, and C4) were normal.